Today marked the beginning of a five-day weekend in our household. Both my husband and I are planning to spend the Independence Day holiday weekend at home with family and friends and enjoying some good summertime food. After spending half the day at the wine shop, grocery store, and Costco (believe it or not, we love running errands together, particularly if they involve food shopping), we were ready to go to work on our dinner. I decided to try a Low Country Boil. It's a southern-style shrimp boil and typically includes some combination of smoked sausage, potatoes, corn, and shellfish. 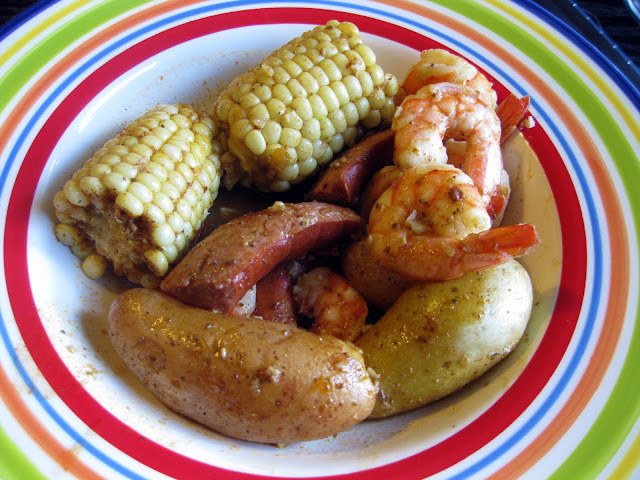 I didn't have a recipe, but I've read a few recipes and I've watched Paula Deen on The Food Network, so I figured I'd make my own version of Low Country Boil, Delaware-style. We figured this would be a great celebratory meal, since we're celebrating the four-year anniversary of the adoption of two of our family dogs: Zelda, our Papillion, and Jonesie, my mom's Mini Dachshund. Both dogs were adopted on July 3, 2006 from the Delaware SPCA. No, the dogs didn't get any low country boil, but they did beg as we enjoyed each bite. I didn't have any crabs, plus we aren't fans of picking out crab meat. My husband is from Maryland and we both love Old Bay, so I figured I'd throw some of that in. We always have kielbasa in the fridge, so that was a go. Corn was on sale for 17 cents an ear, so we threw it in, too. We had shrimp in the freezer and a past-it's-prime bag of fingerling potatoes in the pantry. Beyond that, I just started cooking. First I cut up and browned one pound of kielbasa. I used my favorite, Hillshire Farms Lite. It doesn't give off much fat, so I added a few tablespoons of extra virgin olive oil to keep it from sticking. Then I removed the kielbasa from the pot and added some chopped garlic. Garlic makes everything taste better. I made sure not to cook the garlic for more than 60 seconds because I didn't want to burn it. Next came the fun part. I dumped in a cocktail of clam juice, water, old bay, and tomato paste. I also threw the (thoroughly scrubbed) fingerling potatoes into the pot of cold broth. I brought it up to a boil and let it roll for about 20 minutes. The broth has a great layered flavor. It's surprisingly flavorful, considering that it's mostly water. It's not to salty, not spicy, but rich and savory. Next I threw in some corn (and a little more Old Bay, for good luck), added the kielbasa back to the pot, and cooked it another 10 minutes. Finally, I threw in the shrimp (and a little more Old Bay), put the lid on for three minutes, then it was party time! I invited my mom over, we popped open a bottle of Pinot Grigio (the hubs had some craft beer from our Boston trip), and we got down and dirty with the Low Country Boil. All that was left was a pile of shrimp tails and corn cobs. The juice from this boil was so good that we poured it into our bowls and then sopped it up with crusty bread. This meal took less than 45 minutes from start to finish and it was restaurant-quality. We pulled it off for less than $20 and it would have cost much more if we had gone out. I recommend this for casual entertaining, or any day you just want to celebrate summer. My husband doesn't even love seafood and he enjoyed this. Just make sure you try to eat it all in on serving... I'm not sure this would be great reheated. Cut the kielbasa into chunks and brown over medium-high heat in a large stockpot with 2 tablespoons of oil. Remove kielbasa from pot and set aside. Reduce heat to low and cook garlic for one minute. Deglaze the pan with clam juice, water, tomato paste, and Old Bay. Immediately add potatoes to pot. Cover pot loosely with its lid and boil potatoes on high (or medium-high) for 20 minutes or until they can be pierced with a fork. (Don't overcook the potatoes, you'll be cooking them a bit more as the recipe continues). Keep an eye on the potatoes and add more water (to barely cover potatoes) as necessary. Add corn and cooked kielbasa to the pot. Add more Old Bay, if desired. Cover and cook for an additional ten minutes. Add raw shrimp and cook for three minutes, or until shrimp is just pink. Add more Old Bay, if desired. Serve in shallow bowls and ladle the broth over each serving. Crusty bread is great for sopping up the juice. For never having made this before and not following a recipe you did pretty darn good. Everything looks so wonderfully seasoned. Looks like there's enough for me. Got any leftovers? hmm! Now that looks like something I def need to try. HAPPY 4TH WEEKEND! i have got to start going to the farmer's market on sunday mornings. 17 cents for corn! omg! i'm not big on seafood boils, but i'm sure I sure I could make something like this on that fantastic budget!